Radical leftist group slams prime minister's attempts to unite the small right-wing parties. "It's sad." Radical leftist group Peace Now attacked Prime Minister Benjamin Netanyahu following his attempts to unite the small right-wing parties, including the Otzma Yehudit party, affiliated with the legacy of Rabbi Meir Kahane. "Thirty-four years ago, most of the Knesset walked out demonstratively from the plenum when Meir Kahane spoke. This is also what all Likud members did. Now the prime minister and the leader of the Likud is doing everything to bring the Kahanists into the Knesset and perpetuate the legacy of Jewish racism," Peace Now said. "More than anything, it's mainly sad." Rabbi Kahane, the controversial founder of the Jewish Defense League in the US and the Kach Party in Israel, served in the Knesset from 1984 to 1988, but was banned from running for reelection over his call to expel the country’s Arab population. Two years after he was banned from the Knesset, Rabbi Kahane was assassinated in New York City by an Arab terrorist with ties to the Al Qaeda terror organization. 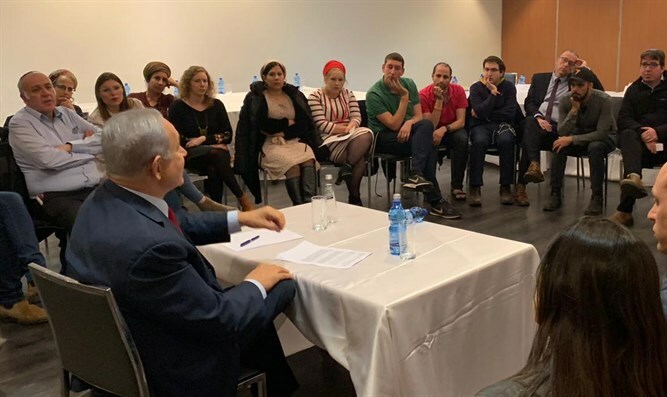 Prime Minister Benjamin Netanyahu on Monday evening called on the Jewish Home, National Union, Otzma Yehudit,and Yahad parties to unite, saying that such a union could prevent the right from losing at least 6-7 seats in the upcoming Knesset elections. "These votes must not be lost because in the end, it’s either a left-wing government or a right-wing government,” Netanyahu said. “The split on the right will inevitably lead to a loss in the elections. Therefore, I turn to you and therefore I hold phone calls and meetings with all the heads of these parties in order to unite and connect," Netanyahu said. The prime minister stressed that while "none of [these parties] passes the electoral threshold [alone], alliance between them will bring at least 6-7 seats. Joining one of them with the Likud does not add seats according to our polls, and therefore it does not achieve the goal."